Prince Charles and the Duchess of Cornwall have officially opened a new railway station in north Wales as they continue their annual summer tour. The couple toured a new museum on the Talyllyn Railway in Gwynedd and met some of the volunteers who help keep it running. 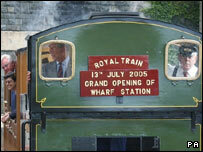 Prince Charles had arrived at Tywyn Wharf Station on the footplate of the steam engine No 7 "Tom Rolt". It is the couple's first Welsh tour since their wedding earlier this year. Volunteer Neil Jones, 18, from Tamworth in Staffordshire, said they had asked him how he had got involved with the railway. "I explained that there is a group of young people who all volunteer and it is great fun," he said. "They seemed to be enjoying the visit and it was a great honour to meet them." After unveiling a plaque at the station, they met local children from Penybryn primary school. Abby Goddard, 10, said: "Camilla is lovely, she even let me smell her flowers which were very pretty. "Prince Charles said it was very hot travelling on the train - he was nice." Later, the couple travelled to Ceredigion to visit a cheese-making farm in Llanddewi Bref. On Tuesday, the three-day visit started with a trip to Coleg Sir Gar near Llandeilo. The royal couple met full-time students at the college and farmers' wives and daughters taking IT courses there. In the afternoon, they visited a Welsh Black Cattle and dairy farm in the Gwendraeth Valley, where they met a 22,000 guineas prize bull named Hafodesgob Hari. They also travelled to the Cross Hands Business Park to officially open the Cig Calon Cymru Cyf Abattoir.